It all started with Photoshop Contest Ending 6.9.09: What Your Pets Are Doing When You’re Not Home where user name Bishopwhitet posted the now famous dog-fort picture on June 4, 2009. 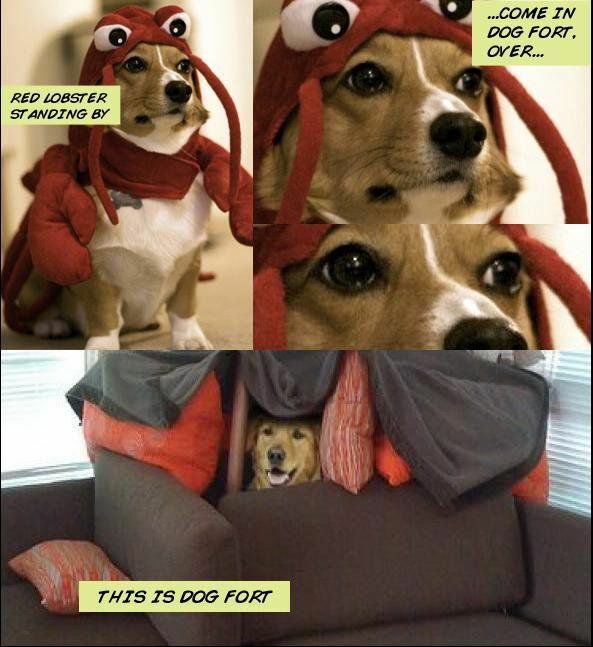 That lead to a fellow Redditor that goes by the name Scottacus which posted the first dog-fort comic strip Come in, dog fort. Over. on November 5th, 2010. Which subsequently lead to an overwhelming “upvote” response by fellow redditors. Due to the overwhelming positive response, fellow redditor jasonjulias made a subreddit found here http://www.reddit.com/r/Dogfort/ on December 9th, 2010. In over a day we had 891 subscribers and in the past 5 days are up to 7466 subscribers and counting. This could not happen without the dedicated and witty contributors to r/dogfort who are releasing great strips. Keep up the good work! A disclaimer: www.dogfort.net is not in anyway affiliated with us nor were they anyway involved with the making of the comics or subreddit.